Aboriginal songs, drumming and prayers honoured a herd of Elk Island National Park bison Sunday being shipped to Banff to reintroduce the long-missing species back into the mountains. "We're handing them off ceremonially, and those blessings will go with them," said Samson Cree Nation Chief Kurt Buffalo, who took part in the event at the park 50 kilometres east of Edmonton. "Mother Earth hasn't heard those buffalo footsteps in Banff for a long time. It's about restoring a balance." Plains bison roamed along the Eastern Slopes of the Rockies for thousands of years until they were eliminated by hunting in the mid-1800s. Parks Canada has been working for years with First Nations to bring the animals back to Banff for spiritual, cultural and ecological reasons. Now the 16 bison, mostly young, pregnant females, are about to leave Elk Island for their new home. They'll be loaded into shipping containers next week and hauled by flatbed truck to the end of a gravel road in Banff, where a helicopter will fly them 20 kilometres to a backcountry pasture, said Karsten Heuer, Parks Canada's manager for the $6.5-million project. The bison will be held in the pasture for 16 months, enough time for them to have a second set of calves that will help tie them to the area before they're released in June 2018 into 1,200 square kilometres on the east side of the park. Officials will monitor their progress for five years to ensure the herd remains a healthy size and doesn't wander on to adjoining provincial land or private property, where some owners fear they'll cause damage, Heuer said. In future, it's possible First Nation members might again be allowed to hunt the animals on which they once depended for survival. "We have full confidence that there's adequate habitat, enough to support them year-around," Heuer said. "We're witnessing a tremendous amount of excitement among First Nations and Métis about the prospect of bringing bison back to Banff." Elk Island, which has about 430 plains bison and 300 of the larger wood bison, has sent surplus animals to repopulate sections of their former grazing lands in Canada, the United States and Russia. "Given the genetic diversity and long-standing disease-free status in Elk Island, this is the nursery herd for the world for bison conservation," park superintendent Dale Kirkland said. The Buffalo Treaty signed in 2014 by more than 20 Alberta, Saskatchewan and U.S. First Nations aims to bring back bison physically and as a symbol of their culture. Buffalo, who said Samson is a treaty signatory, hopes the animals can start being restored to First Nations and other areas they once roamed within a couple of years. 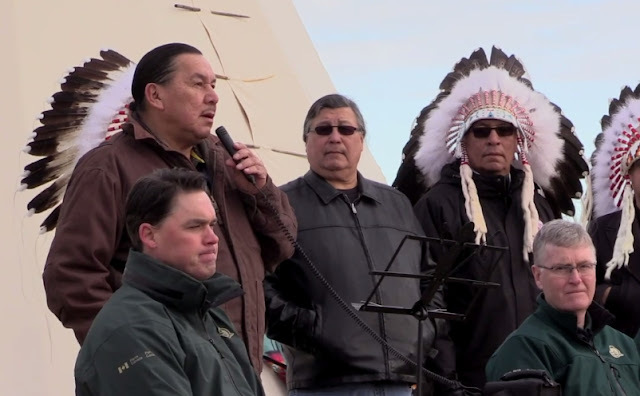 "This is their natural environment and we have kind of displaced them … Let's look collectively at how we can heal our people, Mother Earth and the environment." 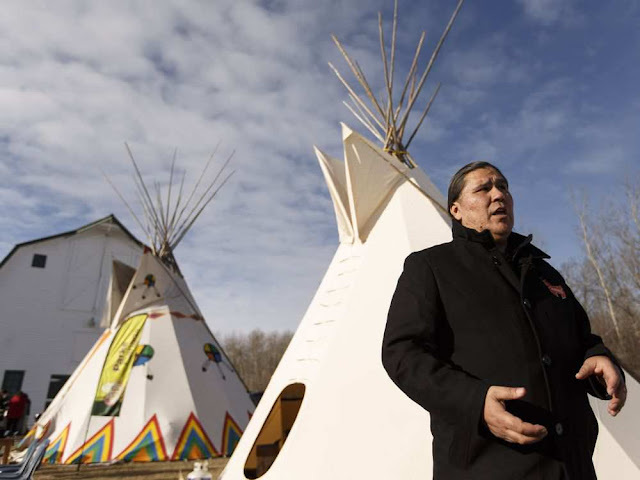 Responses to "Aboriginal leaders bless bison at Elk Island National Park bound for Banff "